So. Fillers. Where do you stand on them? Personally, though I recognise the dreaded facial slide south that happens in your forties, I’m not sure I want to deal with it by injecting stuff into my face. Filler creams, on the other hand, those I can deal with. Especially when they come from one of the most reliable French pharmacy brands, La Roche Posay. The down side to filler creams is that they’re only effective for as long as you use them, as opposed to injectible fillers where the result is inevitably longer lasting. But still, I’d rather use a cream than a needle. 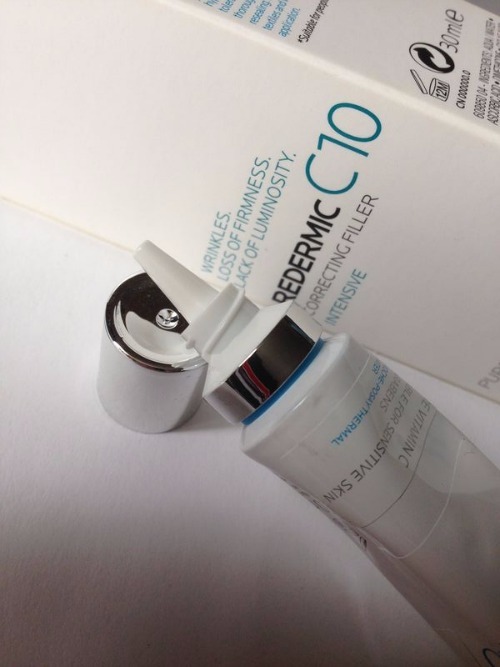 La Roche Posay’s Redermic C10 is a filler cream designed for daily use. It combines 10% pure Vitamin C in its most soluble and effective form, with Vitamin E and Hyaluronic acid and is suitable for sensitive skin. As is often the case with French pharmacy products, it doesn’t have added perfumes, though it does have a slightly chemist-y scent. I’ve been using it in the day time for the last few months and I definitely like it, and can see a difference. It absorbs instantly and actually does deliver on its promise of minimising fine lines, since it’s so hydrating it makes fine lines caused by dehydration look smoother. I found that it was a particularly good partner with Fillerina Night Cream, or many people use it along side La Roche Posay’s Redermic R retinol cream. The texture is very light, like a serum rather than a cream. Since Vitamin C can react with the air, you need to wipe the nozzle after use as any residue will turn yellow – this is why the nozzle is quite fine, to protect the active ingredients from the air. So don’t leave it lying around with the lid off. You can use filler creams under moisturiser and BB cream (or whatever base you prefer). If your skin is especially dry then you might want to add in a first step of serum as well, but leave it a minute or two to absorb before layering further. 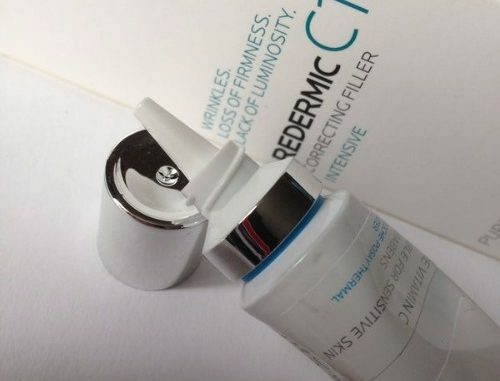 What you won’t need is a separate primer, as Redermic C10 contains silicone, so if you were to add a silicone primer on top of that then it would probably pill up on the skin and clump into little white bits on your face. Not the look we’re after. I have been using it in combination with some Korean products – on top of Benton Essence and under Benton Steam Cream. I found that it sank in straight away with no irritation or redness, so I could add the moisturiser with having to hang around for ages waiting for it to absorb. Unsurprisingly, it paired particularly well with my new fave BB cream, La Roche Posay’s Effaclar Blur (though you do have to pat them on fairly cautiously to avoid pilling since both contain silicone). However, because it contains dimethicone, some people can react negatively to this ingredient, so it won’t suit absolutely everybody with sensitive skin. I found that it did deliver as promised, with visibly smoother and more luminous skin, so I think it could be a good skincare for staple for anyone dealing with dehydrated skin and fine lines. And no needles required! Redermic C10 Corrrecting Filler by La Roche-Posay is widely available online and in stores. RRP £29.50 for 30ml. Often on special offer in Boots (currently 25% off).